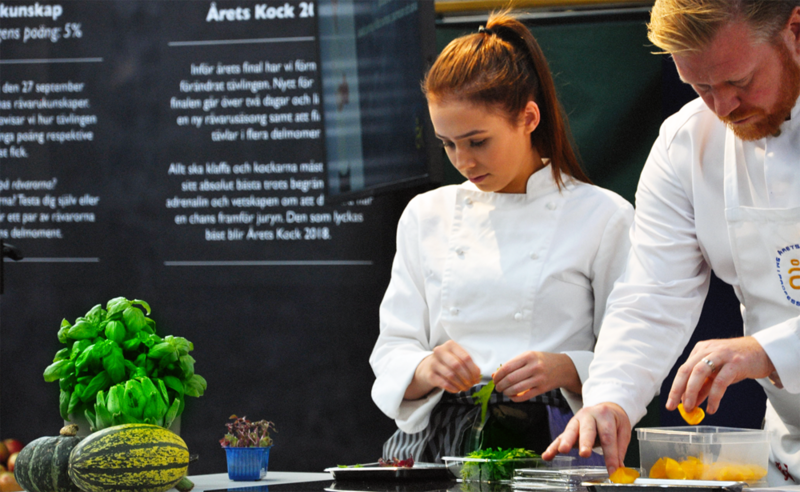 LA+B was engaged to provide wide ranging experience design for Årets Kock 2018, and played an integral role in both overall branding and transformation of Kungliga Tennishallen for the finale event. From early ideation and consulting to graphic design and construction, we were thrilled to be a part of this incredible project and event. Pre-Event: Ideation, graphic design and spatial planning for the venue and event. LA+B produced printed collateral including invitations, outdoor advertising, menus, etc. On site: Årets Kock had an extensive brand presence on site, with all elements designed and produced by LA+B. Multiple stages, banners, posters, displays, photo walls, timelines. Partner exhibitors: As the official creative studio for Årets Kock, we were also responsible for the design and construction of booth spaces for individual exhibiting partner companies. This included graphic design, prop sourcing, custom construction of displays, and furniture for Arla, Steelite, Kockens, Norges Sjømatråd, Diversey, Allt om Mat, Segers, and Electrolux.